​Are you a family with young children? Then chances are you spend a great deal of time doing laundry! Help keep young kids safe by making sure that anything little fingers may try to open, pull on, or play with in the laundry room won't cause a poisoning injury. Laundry detergents are poisonous. So pay close attention to how you store them before, during, and after use. Keep laundry products in their original containers with the original label on them. Close them tightly when not in use. Always put products away out of sight and reach of children and pets. It is best to store them in a high, locked cabinet. Do not store products on top of the washer and dryer or in storage drawers under laundry machines. Read and follow all instructions on the product label. Know where the safety information is located on the label and what to do in case an injury occurs. Never combine laundry detergent with ammonia or other household cleaners, because some chemical mixtures may release irritating or dangerous fumes. If a product container is empty, throw it away properly. Do not reuse detergent buckets or bottles for other uses. Clean up any spills immediately and wash your hands and any items you use to pour or measure products. Close and lock the laundry room door when you are finished, so curious young children cannot get in. Pay special attention to spray bottles. They are a common source of accidental poisoning and should be kept out of a child's reach. Detergent in single-use laundry packets is very concentrated and toxic. If even a small amount of the detergent gets into a child's mouth or eyes, it can cause serious breathing or stomach problems, eye irritation, and even coma and death. Because detergent packets are often brightly colored and may look similar to some candy or gummy treats, children can easily mistake them for something good to eat. Biting a packet can cause it to burst, shooting detergent into the child's mouth and throat or eyes. Between January 1, 2013 and December 31, 2014, the American Association of Poison Control Centers (AAPCC) reported 35,188 cases of laundry detergent exposures. Of these, almost two-thirds were from laundry packets, and three-fourths of the children affected by laundry packet exposures were less than 3 years old. Because they are so concentrated, laundry detergent packets can cause more severe injuries than traditional non-packet laundry detergent. Never let your children handle or play with the packets. The packets dissolve quickly when in contact with water, wet hands, or saliva. Do not remove a packet from the original container until you are ready to put it in the washing machine. Children can get hold of the packets if they are placed in the laundry basket, on top of the washer or dryer, or on a counter before use. Young children move quickly and can often reach higher than you expect! They can grab a packet and put it in their mouth in the time it takes you to reach for a pair of socks. Remember to seal the container and store it in a locked cabinet after each use. Make sure the container is out of sight and reach of children. Adults should follow the instructions on the product label. It is best to use traditional liquid or powder detergent products instead of packets until all children living in or visiting your home are at least 6 years old. Traditional laundry detergent is much less toxic than laundry detergent packets. If your child does get the contents of one of these packets in his mouth or gets any in his eye, call Poison Help at 1-800-222-1222 immediately. Use child locks on front-loading washers and dryers to prevent small children from opening the doors while they are in use and also to prevent them from ever crawling in the machines. Clean the lint trap after each use to help prevent fires. Clogged lint traps are a common cause of house fires. In fact, the Consumer Product Safety Commission (CPSC) reports that washers and dryers were involved in one out of every 22 home fires reported in 2006-2010. Do not lean on or allow children to play or hang on the doors of washers and dryers, because this can cause them to tip over. Vent the dryer outside the home to prevent mold and mildew build-up. 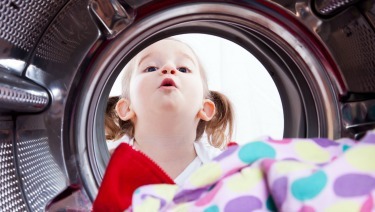 Make a rule in your house that the washer and dryer are not toys. Young children may want to explore this "mysterious opening" we call the laundry chute. While convenient for adults, it poses a great danger for small children. Make sure laundry chute doors are out of the reach of a small child (36 inches or more off the floor). Install child locks to keep your child from opening the chute. Tell your children that the laundry chute is meant only for clothes. Toys and people should never go in the laundry chute.